I've been making myself scarce (and keeping myself sober), for the past couple of months due to dietary/health concerns, but after officially shedding 20 pounds, and shaving almost 20 points off my blood pressure I decided it was time to celebrate by treating myself to a tropical libation. In a recent e-mail discussion with fellow Cocktailian, Kosmonaut, regarding what would constitute an appropriate tiki drink for a large group of people, I'd suggested going with a classic bowl drink like the Scorpion, and multiplying the ingredients to serve the requisite number of imbibers. 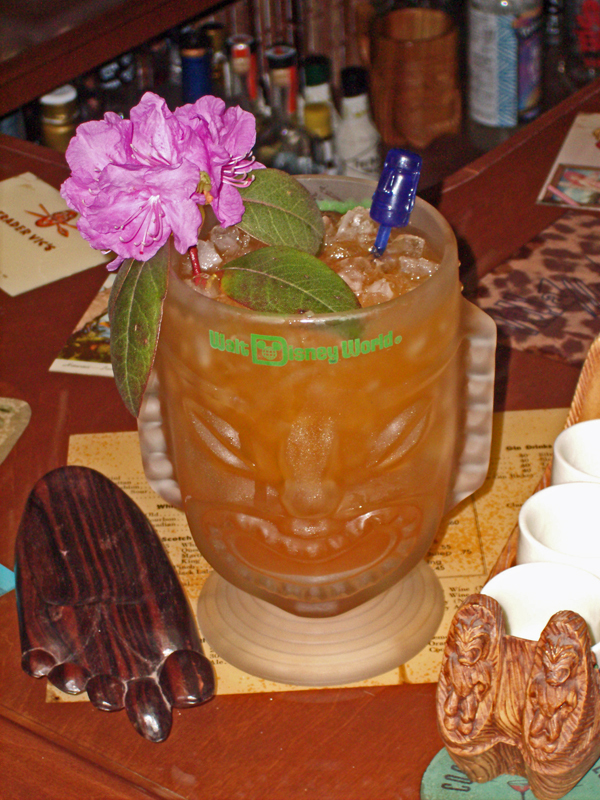 Consequently, I had Scorpions on the brain all day today, so I opened up my copy of Beachbum Berry's Sippin' Safari to the Kelbo's Scorpion recipe, and started tweaking away down in the basement bar. The result can be seen there on the left, and I have dubbed it "Scorpion Rising". No, it's not a tribute to the films of Kenneth Anger, just the cleverest play on words that I could come up with in my semi-inebriated state. As I said, the Scorpion is a bowl drink, meant to serve 2. Unfortunately, I have yet to locate a tiki bowl to add to my collection, so I pulled my large Disney World Polynesian Village goblet down off the shelf to serve in it's place. The recipe is doubled from the Bum's, and I've added several additional ingredients (I'll let you guess which ones). With the addition of a bit more ice, this could've filled a small bowl quite nicely and served 3-4 aloha-shirted, fez-bedecked hipsters equipped with long straws. Add all ingredients to a cocktail shaker half-filled with crushed ice. Shake, then pour into a large goblet or bowl. Add more crushed ice to fill. Garnish with beak flower. The resulting cocktail is smooth, light, and thanks to the Absinthe and bitters, quite aromatic, but it has a serious bite that sneaks up on your about a half-hour later, so don't go making 3 or 4 of these and drinking them all by yourself!